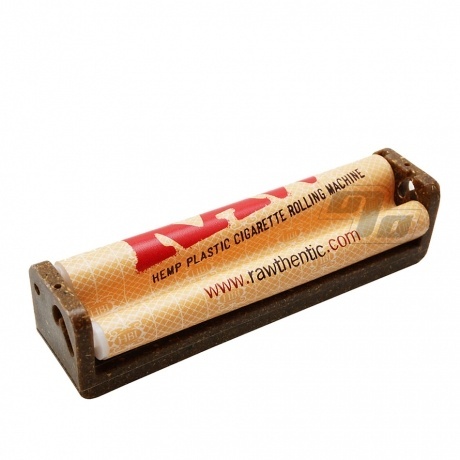 The RAW 110mm Hemp Rolling Machine fits any size rolling paper from single wide up to king size. This unique roller also includes "how to roll" instructions to get you started plus an extra rolling apron to last you a good long while. What makes this king size rolling machine unique is not what it does but what it is made out of. RAW Papers brought us the first rolling machine to be made from a natural hemp composite plastic! The eco friendly hemp plastic was formulated and engineered in Germany. To be truly eco friendly this roller is also built to last. Just about anyone can roll a perfect king size smoke with a rolling machine. Read the instructions and then practice a few times and you're good for life. Seriously easy way to roll that almost feels like cheating. Almost. Easy to use and fast. Love using this roller! Highly recommend it! Once I figured out how to use this thing, I was friggin blown away at how cool it is. Note: if you use dutches, you will have to cut them down a bit; otherwise go for the huge machine. If you cut it down, you can use those if you prefer. The first time i used it, i hadn't thoroughly read the instructions, and my material went all over the place. Then I realized what I was doing wrong, and now it works like a charm. Definitely worth getting. Even better quality than the 1.25 roller, the roller is a bit tight, but they wear in and roll better with use. I was disappointed to not receive a spare rolling sheet should the first one break down. The rolling pins are also not quite together as with my 1.25 roller, but hopefully this improves over time.